A shocking study on poverty in London is spurring the Faculty of Education to help alleviate it one boot at a time. This year, Western Education is participating in the United Way’s ‘Give cold feet the boot’ campaign. Organizers hope to collect 200 children’s boots as part of the United Way’s overall goal of collecting 1,000 boots from across the city. 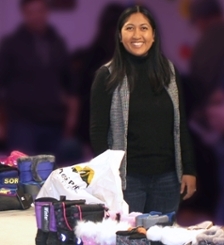 Maly Bun-Lebert is collecting children’s winter boots as part of the faculty’s United Way campaign. She hopes to collect and donate 200 boots to resources centres across London. A recent London Community Foundation report noted that one-quarter of children in London live in poverty. Every boot collected will be donated to resource centres across London. Some of the organizations that will benefit, include: South London Neighbourhood Resource Centre, Crouch Neighbourhood Resource Centre and LUSO Community Services. Bun-Lebert worked for the United Way before joining Western and she currently serves on the United Way’s Board of Directors and she’s chair of the United Way’s GenNext cabinet for young professionals. She believes in the United Way’s mission because her family came to Canada as refugees and they used many United Way funded services, such camps, mentorship programs and after-school activities. The collection, which is part of Western University’s United Way Campaign, runs until Nov. 27. Volunteers are also needed to sort through the boots and deliver them to the resource centres.